The region two winner of the Together We Play™ essay contest comes from South Elgin, Ill. The FUNdation, a not-for-profit 501(c)(3) organization, works to improve the quality of life for the residents of the Village of South Elgin through the development, implementation, and funding of recreation, education, and conservation programs, services and facilities. Read the excerpt below to learn more about their need for inclusive playgrounds. “Imagine an adolescent boy and father visiting a park together. Because of his special needs, the boy is unable to use the swings appropriate for his age, so they try to fit him into a toddler bucket swing. Now imagine the terror of the child and the anxiety of the father when the child becomes stuck in the swing requiring responders to cut him out. Unfortunately, this scene was not imagined. It recently happened at a park in the Village of South Elgin. This entry was posted in Inclusive playgrounds, Sensory play, special needs and tagged inclusive play, play for all abilities, sensory play, sensory stimulation, Together We Play by PlayLSI. Bookmark the permalink. 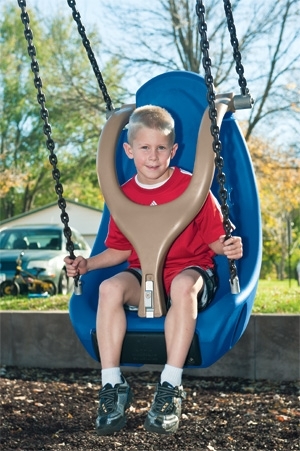 Landscape Structures molded bucket seat should be on every playground!